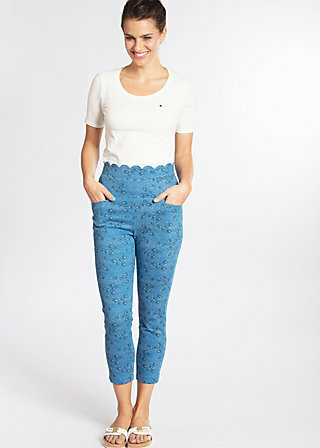 Narrow cut, 7/8 twill pants, decorated with designs that evoke 'la dolce vita' from Blutsgeschwister! The body-accented, waist trousers in the 50s style puts your figure skilfully-refined front and centre: the summer calf length visually stretches your legs, while the refined shell hem conjures up a waist like a femme fatale. A practical zip in the back centre makes the way to the dreamy silhouette easy. The hem and pocket pouches on the front side pockets, as well as the back bum pocket, are made from a specially designed, contrasting fabric and allow the supple trousers to shine with a dose of extravagance. Loving detail: a kissing mouth button near the front, right pocket! Whether with a striped shirt or knotted blouse, the cuddly pants have a welcoming 50s Capri atmosphere in summery travel luggage!